A transit bus ideal for a myriad of situations, Thomas built buses are ideal for long trips, childcare and field trips, and as school buses. Thomas manufacturers many different types of buses to accommodate different needs. All of these buses, however, are heavy-duty, and come complete with stock, heavy duty alternators. One of the reasons that transit and school buses need tough, durable alternators is because of the large electrical load required, especially when the vehicle is at idle. Think about all of the different electrical components that transit and school buses have, that regular passenger cars and trucks do not. With everything from wheelchair lifts to special light systems, these vehicles require a heavy duty, high output alternator. What typically comes stock in these types of buses is a 12-volt, 175-Ampere alternator. 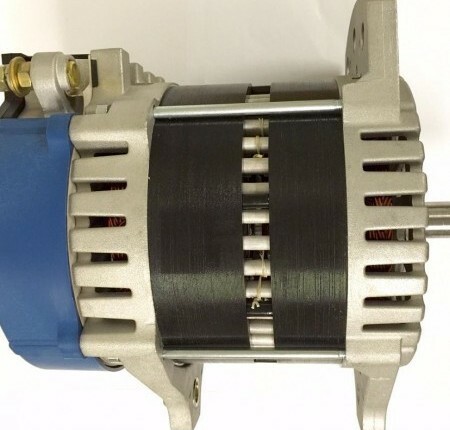 Capable of withstanding heavy electrical loads, this alternator does it job – but at the cost of causing high RPM. Why is this such a problem? An engine that is consistently running at a high RPM at idle wears out more quickly, and in addition this puts more strain on the battery and the alternator itself. Many transit and school bus fleet owners also find themselves installing extra components on their buses, such as load shedding devices, multiple battery packs, and high idle devices. Eco-Tech manufactures comparable alternators to the stock Thomas bus alternators that are more powerful, and just as durable, but allow the engine to run at a lower RPM. Not only does this save on wear and tear while eliminating the need for extra components, this choice is also much more eco-friendly.